On the 7th February we were in the rural city of Mildura, 240km north of Horsham. 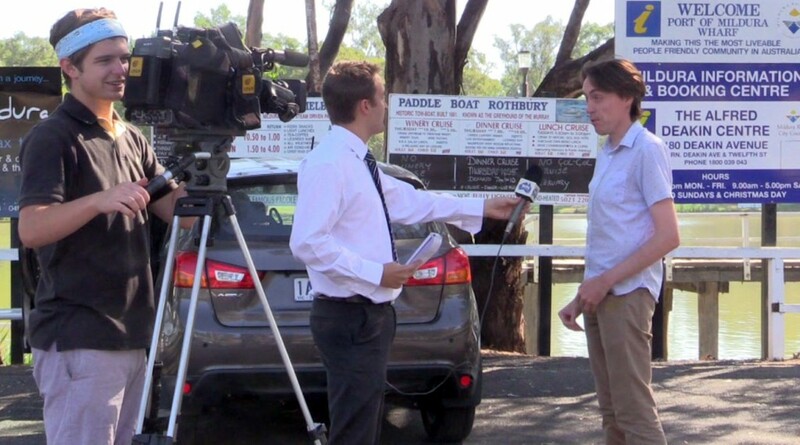 Local TV station WIN News Mildura had contacted us in advance of our arrival, so at 9am we were being interviewed on the banks of the Murray River, at the beautiful Mildura Wharf. Now, Mildura has a population of 30,000 people, so the chance of meeting a Time Twin here, even with the aid of WIN News was remote, so after the interview we headed through the desert to Broken Hill – three hours North. As we settled down for dinner, I received not one but two communications from Time Twins in Mildura who had just seen the news article and wanting to meet. Only one option. First thing the next morning we were back in the car, shooing the goats and emus off the otherwise largely deserted highway as we hurried back to Mildura..